The Greek genocide, including the Pontic genocide, was the systematic killing of the Christian Ottoman Greek population carried out in Anatolia during World War I and its aftermath (1914–1922) on the basis of their religion and ethnicity. It was instigated by the government of the Ottoman Empire and the Turkish national movement against the indigenous Greek population of the Empire and it included massacres, forced deportations involving death marches, summary expulsions, arbitrary execution, and the destruction of Eastern Orthodox cultural, historical, and religious monuments. According to various sources, several hundred thousand Ottoman Greeks died during this period. Most of the refugees and survivors fled to Greece (adding over a quarter to the prior population of Greece). Some, especially those in Eastern provinces, took refuge in the neighbouring Russian Empire. By late 1922 most of the Greeks of Asia Minor had either fled or had been killed. Those remaining were transferred to Greece under the terms of the later 1923 population exchange between Greece and Turkey, which formalized the exodus and barred the return of the refugees. Other ethnic groups were similarly attacked by the Ottoman Empire during this period, including Assyrians and Armenians, and some scholars and organizations have recognized these events as part of the same genocidal policy. The Allies of World War I condemned the Ottoman government-sponsored massacres as crimes against humanity. More recently, the International Association of Genocide Scholars passed a resolution in 2007 recognising the Ottoman campaign against Christian minorities of the Empire, including the Greeks, as genocide. Some other organisations have also passed resolutions recognising the Ottoman campaign against these Christian minorities, as genocide, as have the parliaments of Greece, Cyprus, Sweden, Armenia, the Netherlands, Germany, Austria and the Czech Republic. At the outbreak of World War I, Asia Minor was ethnically diverse, its population including Turks and Azeris, as well as the native groups that had inhabited the region prior to the Turkish conquest, including Pontic Greeks, Caucasus Greeks, Cappadocian Greeks, Armenians, Kurds, Zazas, Georgians, Circassians, Assyrians, Jews, and Laz people. Areas with the presence of Anatolian Greeks in 1910. Demotic Greek speakers in yellow. Pontic Greek in orange. Cappadocian Greek in green with individual towns indicated. Shaded regions do not indicate that Greek-speakers were a majority. 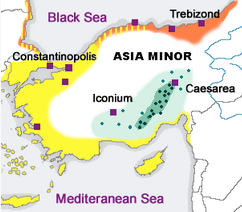 The Greek presence in Asia Minor dates at least from the Late Bronze Age (1450 BC). The Greek poet Homer lived in the region around 800 BC. The geographer Strabo referred to Smyrna as the first Greek city in Asia Minor, and numerous ancient Greek figures were natives of Anatolia, including the mathematician Thales of Miletus (7th century), the pre-Socratic philosopher Heraclitus of Ephesus (6th century BC), and the founder of Cynicism Diogenes of Sinope (4th century BC). Greeks referred to the Black Sea as the "Euxinos Pontos" or "hospitable sea" and starting in the eighth century BC they began navigating its shores and settling along its Anatolian coast. The most notable Greek cities of the Black Sea were Trebizond, Sampsounta, Sinope and Heraclea Pontica. During the Hellenistic period (334 BC – 1st century BC), which followed the conquests of Alexander the Great, Greek culture and language began to dominate even the interior of Asia Minor. The Hellenization of the region accelerated under Roman and early Byzantine rule, and by the early centuries AD the local Indo-European Anatolian languages had become extinct, being replaced by the Koine Greek language. From this point until the late Middle Ages all of the indigenous inhabitants of Asia Minor practiced Christianity (called Greek Orthodox Christianity after the East–West Schism with the Catholics in 1054) and spoke Greek as their first language. The resultant Greek culture in Asia Minor flourished during a millennium of rule (4th century - 15th century AD) under the Greek-speaking Eastern Roman (Byzantine) Empire, whose citizens were known as Byzantine Greeks. The inhabitants of Asia Minor constituted the bulk of the empire's Greek-speaking Orthodox Christian inhabitants; thus, many renowned Greek figures during late antiquity, the Middle Ages, and the Renaissance came from the native peoples of Asia Minor, including Saint Nicholas (270–343 AD), rhetorician John Chrysostomos (349–407 AD), Hagia Sophia architect Isidore of Miletus (6th century AD), several imperial dynasties, including the Phokas (10th century) and Komnenos (11th century), and Renaissance scholars George of Trebizond (1395–1472) and Basilios Bessarion (1403–1472). Thus, when the Turkic peoples began their late medieval conquest of Asia Minor, Byzantine Greek citizens were the largest group of inhabitants there. Even after the Turkic conquests of the interior, the mountainous Black Sea coast of Asia Minor remained the heart of a populous Greek christian state, the Empire of Trebizond, until its eventual conquest by the Ottoman Turks in 1461, one year after the fall to the Ottomans of the European region now called Greece. Over the next four centuries the Greek natives of Asia Minor gradually became a minority in these lands, as members of their community underwent Turkification, converting to Islam to escape onerous tax obligations and legal limitations imposed on religious minorities, or simply in order to assimilate to the now dominant Turkish culture. Beginning in the spring of 1913, the Ottomans implemented a programme of expulsions and forcible migrations, focusing on Greeks of the Aegean region and eastern Thrace, whose presence in these areas was deemed a threat to national security. The Ottoman government adopted a "dual-track mechanism"[clarification needed] allowing it to deny responsibility for and prior knowledge of this campaign of intimidation, emptying Christian villages. The involvement in certain cases of local military and civil functionaries in planning and executing anti-Greek violence and looting led ambassadors of Greece and the Great Powers and the Patriarchate to address complaints to the Porte. In protest to government inaction in the face of these attacks and to the so-called "Muslim boycott" of Greek products that had begun in 1913, the Patriarchate closed Greek churches and schools in June 1914. Responding to international and domestic pressure, Talat Pasha headed a visit in Thrace in April 1914 and later in the Aegean to investigate reports and try to soothe bilateral tension with Greece. While claiming that he had no involvement or knowledge of these events, Talat met with Kuşçubaşı Eşref, head of the "cleansing" operation in the Aegean littoral, during his tour and advised him to be cautious not to be "visible". One of the worst attacks of this campaign attack took place in Phocaea (Greek: Φώκαια), on the night of 12 June 1914, a town in western Anatolia next to Smyrna, where Turkish irregular troops destroyed the city, killing 50 or 100 civilians and causing its population to flee to Greece. French eyewitness Charles Manciet states that the atrocities he had witnessed at Phocaea were of an organized nature that aimed at circling[clarification needed] Christian peasant populations of the region. In another attack against Serenkieuy, in Menemen district, the villagers formed armed resistance groups but only a few managed to survive being outnumbered by the attacking Muslim irregular bands. During the summer of the same year the Special Organization (Teşkilat-ı Mahsusa), assisted by government and army officials, conscripted Greek men of military age from Thrace and western Anatolia into Labour Battalions in which hundreds of thousands died. These conscripts, after being sent hundreds of miles into the interior of Anatolia, were employed in road-making, building, tunnel excavating and other field work; but their numbers were heavily reduced through privations and ill-treatment and through outright massacre by their Ottoman guards. Phocaea in flames, during the massacre perpetrated by Turkish irregulars in June 1914. Following similar accords made with Bulgaria and Serbia, the Ottoman Empire signed a small voluntary population exchange agreement with Greece on 14 November 1913. Another such agreement was signed 1 July 1914 for the exchange of some "Turks" (that is, Muslims) of Greece for some Greeks of Aydin and Western Thrace, after the Ottomans had forced these Greeks from their homes in response to the Greek annexation of several islands. The swap was never completed due to the eruption of World War One. While discussions for population exchanges were still conducted, Special Organization units attacked Greek villages forcing their inhabitants to abandon their homes for Greece, being replaced with Muslim refugees. The forceful expulsion of Christians of western Anatolia, especially Ottoman Greeks, has many similarities with policy towards the Armenians, as observed by US ambassador Henry Morgenthau and historian Arnold Toynbee. In both cases, certain Ottoman officials, such as Şükrü Kaya, Nazım Bey and Mehmed Reshid, played a role; Special Organization units and labour battalions were involved; and a dual plan was implemented combining unofficial violence and the cover of state population policy. This policy of persecution and ethnic cleansing was expanded to other parts of the Ottoman Empire, including Greek communities in Pontus, Cappadocia, and Cilicia. Hellenism in Near East during and after World War I, showing some of the areas (Western Anatolia and Eastern Thrace) where the Greek population was concentrated. The Pontic region is not shown. However, after November 1914 Ottoman policy towards the Greek population shifted; state policy was restricted to the forceful migration to the Anatolian hinterland of Greeks living in coastal areas, particularly the Black Sea region, close to the Turkish-Russian front. This change of policy was due to a German demand for the persecution of Ottoman Greeks to stop, after Eleftherios Venizelos had made this a condition of Greece's neutrality when speaking to the German ambassador in Athens. Venizelos also threatened to undertake a similar campaign against Muslims that were living in Greece in the event that Ottoman policy did not change. While the Ottoman government tried to implement this change in policy, it was unsuccessful and attacks, even murders, continued to occur unpunished by local officials in the provinces, despite repeated instructions in cables sent from the central administration. Arbitrary violence and extortion of money intensified later, providing ammunition for the Venizelists arguing that Greece should join the Entente. In July 1915 the Greek chargé d'affaires claimed that the deportations "can not be any other issue than an annihilation war against the Greek nation in Turkey and as measures hereof they have been implementing forced conversions to Islam, in obvious aim to, that if after the end of the war there again would be a question of European intervention for the protection of the Christians, there will be as few of them left as possible." According to George W. Rendel of the British Foreign Office, by 1918 "over 500,000 Greeks were deported of whom comparatively few survived". In his memoirs, the United States ambassador to the Ottoman Empire between 1913 and 1916 wrote "Everywhere the Greeks were gathered in groups and, under the so-called protection of Turkish gendarmes, they were transported, the larger part on foot, into the interior. Just how many were scattered in this fashion is not definitely known, the estimates varying anywhere from 200,000 up to 1,000,000." Despite the shift of policy, the practice of evacuating Greek settlements and relocating the inhabitants was continued, albeit on a limited scale. Relocation was targeted at specific regions that were considered militarily vulnerable, not the whole of the Greek population. As a 1919 Patriarchate account records, the evacuation of many villages was accompanied with looting and murders, while many died as a result of not having been given the time to make the necessary provisions or of being relocated to uninhabitable places. State policy towards Ottoman Greeks changed again in the fall of 1916. With Entente forces occupying Lesbos, Chios and Samos since spring, the Russians advancing in Anatolia and Greece expected to enter the war siding with the Allies, preparations were made for the deportation of Greeks living in border areas. In January 1917 Talat Pasha sent a cable for the deportation of Greeks from the Samsun district "thirty to fifty kilometres inland" taking care for "no assaults on any persons or property". However, the execution of government decrees, which took a systematic form from December 1916, when Behaeddin Shakir came to the region, was not conducted as ordered: men were taken in labour battalions, women and children were attacked, villages were looted by Muslim neighbours. As such in March 1917 the population of Ayvalik, a town of c. 30,000 inhabitants on the Aegean coast was forcibly deported to the interior of Anatolia under order by German General Liman von Sanders. The operation included death marches, looting, torture and massacre against the civilian population. Germanos Karavangelis, the bishop of Samsun, reported to the Patriarchate that thirty thousands had been deported to the Ankara region and the convoys of the deportees had been attacked, with many being killed. Talat Pasha ordered an investigation for the looting and destruction of Greek villages by bandits. Later in 1917 instructions were sent to authorize military officials with the control of the operation and to broaden its scope, now including persons from cities in the coastal region. However, in certain areas Greek populations remained undeported. Greek deportees were sent to live in Greek villages in the inner provinces or, in some case, villages where Armenians were living before being deported. Greek villages evacuated during the war due to military concerns were then resettled with Muslim immigrants and refugees. According to cables sent to the provinces during this time, abandoned movable and non-movable Greek property was not to be liquidated, as that of the Armenians, but "preserved". What above all appears as an unnecessary cruelty is that the deportation is not limited to the men alone, but is extended likewise to women and children. This is supposedly done in order to much easier be able to confiscate the property of the deported. According to Rendel, atrocities such as deportations involving death marches, starvation in labour camps etc. were referred to as "white massacres". Ottoman official Rafet Bey was active in the genocide of the Greeks and in November 1916, Austrian consul in Samsun, Kwiatkowski, reported that he said to him "We must finish off the Greeks as we did with the Armenians ... today I sent squads to the interior to kill every Greek on sight". Pontic Greeks responded by forming insurgent groups, which carried weapons salvaged from the battlefields of the Caucasus Campaign of World War I or directly supplied by the Russian army. In 1920, the insurgents reached their peak in regard to manpower numbering 18,000 men. On 15 November 1917, Ozakom delegates agreed to create a unified army composed of ethnically homogeneous units, Greeks were allotted a division consisting of three regiments. The Greek Caucasus Division was thus formed out of ethnic Greeks serving in Russian units stationed in the Caucasus and raw recruits from among the local population including former insurgents. The division took part in numerous engagements against the Ottoman army as well as Muslim and Armenian irregulars, safeguarding the withdrawal of Greek refugees into the Russian held Caucasus, before being disbanded in the aftermath of the Treaty of Poti. Ghost town of Kayakoy (Livisi), southwestern Anatolia, once a Greek-inhabited settlement. According to local tradition, Muslims refused to repopulate the place because "it was infested with the ghosts of Livisians massacred in 1915". After the Ottoman Empire capitulated on 30 October 1918, it came under the de jure control of the victorious Entente Powers. However, the latter failed to bring the perpetrators of the genocide to justice, although in the Turkish Courts-Martial of 1919–20 a number of leading Ottoman officials were accused of ordering massacres against both Greeks and Armenians. Thus, killings, massacres and deportations continued under the pretext of the national movement of Mustafa Kemal (later Ataturk). In an October 1920 report a British officer describes the aftermath of the massacres at İznik in north-western Anatolia in which he estimated that at least 100 decomposed mutilated bodies of men, women and children were present in and around a large cave about 300 yards outside the city walls. The systematic massacre and deportation of Greeks in Asia Minor, a program which had come into effect in 1914, was a precursor to the atrocities perpetrated by both the Greek and Turkish armies during the Greco-Turkish War, a conflict which followed the Greek landing at Smyrna in May 1919 and continued until the retaking of Smyrna by the Turks and the Great Fire of Smyrna in September 1922. Rudolph Rummel estimated the death toll of the fire at 100,000 Greeks and Armenians, who perished in the fire and accompanying massacres. According to Norman M. Naimark "more realistic estimates range between 10,000 to 15,000" for the casualties of the Great Fire of Smyrna. Some 150,000 to 200,000 Greeks were expelled after the fire, while about 30,000 able-bodied Greek and Armenian men were deported to the interior of Asia Minor, most of whom were executed on the way or died under brutal conditions. George W. Rendel of the British Foreign Office noted the massacres and deportations of Greeks during the Greco-Turkish War. According to estimates by Rudolph Rummel, between 213,000 and 368,000 Anatolian Greeks were killed between 1919 and 1922. There were also massacres of Turks carried out by the Hellenic troops during the occupation of western Anatolia from May 1919 to September 1922. For the massacres that occurred during the Greco-Turkish War of 1919–1922, British historian Arnold J. Toynbee wrote that it was the Greek landings that created the Turkish National Movement led by Mustafa Kemal: "The Greeks of 'Pontus' and the Turks of the Greek occupied territories, were in some degree victims of Mr. Venizelos's and Mr. Lloyd George's original miscalculations at Paris." Photo taken after the Smyrna fire. The text inside indicates that the photo had been taken by representatives of the Red Cross in Smyrna. Translation: "Elderly and children were not spared"
In 1917 a relief organization by the name of the Relief Committee for Greeks of Asia Minor was formed in response to the deportations and massacres of Greeks in the Ottoman Empire. The committee worked in cooperation with the Near East Relief in distributing aid to Ottoman Greeks in Thrace and Asia Minor. The organisation disbanded in the summer of 1921 but Greek relief work was continued by other aid organisations. Smyrna, 1922. Translation: "No children were allowed to live"
The accounts describe systematic massacres, rapes and burnings of Greek villages, and attribute intent to Ottoman officials, namely the Ottoman Prime Minister Mahmud Sevket Pasha, Rafet Bey, Talat Pasha and Enver Pasha. Additionally, The New York Times and its correspondents made extensive references to the events, recording massacres, deportations, individual killings, rapes, burning of entire Greek villages, destruction of Greek Orthodox churches and monasteries, drafts for "Labor Brigades", looting, terrorism and other "atrocities" for Greek, Armenian and also for British and American citizens and government officials. Australian press also had some coverage of the events. Henry Morgenthau, the United States ambassador to the Ottoman Empire from 1913 to 1916, accused the "Turkish government" of a campaign of "outrageous terrorizing, cruel torturing, driving of women into harems, debauchery of innocent girls, the sale of many of them at 80 cents each, the murdering of hundreds of thousands and the deportation to and starvation in the desert of other hundreds of thousands, [and] the destruction of hundreds of villages and many cities", all part of "the willful execution" of a "scheme to annihilate the Armenian, Greek and Syrian Christians of Turkey". However, months prior to the First World War, 100,000 Greeks were deported to Greek islands or the interior which Morgenthau stated, "for the larger part these were bona-fide deportations; that is, the Greek inhabitants were actually removed to new places and were not subjected to wholesale massacre. It was probably the reason that the civilized world did not protest against these deportations". US Consul-General George Horton, whose account has been criticised by scholars as anti-Turkish, claimed, "One of the cleverest statements circulated by the Turkish propagandists is to the effect that the massacred Christians were as bad as their executioners, that it was '50–50'." On this issue he comments: "Had the Greeks, after the massacres in the Pontus and at Smyrna, massacred all the Turks in Greece, the record would have been 50–50—almost." As an eye-witness, he also praises Greeks for their "conduct ... toward the thousands of Turks residing in Greece, while the ferocious massacres were going on", which, according to his opinion, was "one of the most inspiring and beautiful chapters in all that country’s history". Smyrna burning during the Fire of Smyrna. According to different estimates some 10.000, to 100,000 Greeks and Armenians were killed in the fire and accompanying massacres. Newspaper published by The Scotsman on 20 July 1915 entitled, "Greek Population of Turkey, A Crisis At Aivali"
Smyrna citizens trying to reach the Allied ships during the Smyrna fire, 1922. The photo had been taken from the launch boat of a US battleship. For the whole of the period between 1914 and 1922 and for the whole of Anatolia, there are academic estimates of death toll ranging from 289,000 to 750,000. The figure of 750,000 is suggested by political scientist Adam Jones. Scholar Rudolph Rummel compiled various figures from several studies to estimate lower and higher bounds for the death toll between 1914 and 1923. He estimates that 384,000 Greeks were exterminated from 1914 to 1918, and 264,000 from 1920 to 1922. The total number reaching 648,000. Historian Constantine G Hatzidimitriou writes that "loss of life among Anatolian Greeks during the WWI period and its aftermath was approximately 735,370". Some contemporary sources claimed different death tolls. The Greek government collected figures together with the Patriarchate to claim that a total of one million people were massacred. A team of American researchers found in the early postwar period that the total number of Greeks killed may approach 900,000 people. Edward Hale Bierstadt, writing in 1924, stated that "According to official testimony, the Turks since 1914 have slaughtered in cold blood 1,500,000 Armenians, and 500,000 Greeks, men women and children, without the slightest provocation.". On 4 November 1918, Emanuel Efendi, an Ottoman deputy of Aydin, criticised the ethnic cleansing of the previous government and reported that 550,000 Greeks had been killed in the coastal regions of Anatolia (including the Black Sea coast) and Aegean Islands during the deportations. According to various sources the Greek death toll in the Pontus region of Anatolia ranges from 300,000 to 360,000. Merrill D. Peterson cites the death toll of 360,000 for the Greeks of Pontus. According to George K. Valavanis, "The loss of human life among the Pontian Greeks, since the Great War (World War I) until March 1924, can be estimated at 353,000, as a result of murders, hangings, and from punishment, disease, and other hardships." Valavanis derived this figure from the 1922 record of the Central Pontian Council in Athens based on the Black Book of the Ecumanical Patriachate, to which he adds "50,000 new martyrs", which "came to be included in the register by spring 1924". Article 142 of the 1920 Treaty of Sèvres, prepared after the first World War, called the Turkish regime "terrorist" and contained provisions "to repair so far as possible the wrongs inflicted on individuals in the course of the massacres perpetrated in Turkey during the war." The Treaty of Sèvres was never ratified by the Turkish government and ultimately was replaced by the Treaty of Lausanne. That treaty was accompanied by a "Declaration of Amnesty", without containing any provision in respect to punishment of war crimes. In 1923, a population exchange between Greece and Turkey resulted in a near-complete ending of the Greek ethnic presence in Turkey and a similar ending of the Turkish ethnic presence in much of Greece. According to the Greek census of 1928, 1,104,216 Ottoman Greeks had reached Greece. It is impossible to know exactly how many Greek inhabitants of Turkey died between 1914 and 1923, and how many ethnic Greeks of Anatolia were expelled to Greece or fled to the Soviet Union. Some of the survivors and expelled took refuge in the neighboring Russian Empire (later, Soviet Union). [citation needed] Similar plans for a population exchange had been negotiated earlier, in 1913–1914, between Ottoman and Greek officials during the first stage of the Greek genocide but had been interrupted by the onset of World War I. In 1955, the Istanbul Pogrom caused most of the Greek inhabitants remaining in Istanbul to flee and migrate from there. Historian Alfred-Maurice de Zayas identifies Istanbul Pogroms as a very serious crime against humanity and he states that the flight and big migration of Greeks after the pogrom corresponds to the "intent to destroy in whole or in part" criteria of the Genocide Convention. Among the victims of the atrocities committed by the Turkish nationalist Army (1922–23) were hundreds of Christian clergy in Anatolia, including metropolitan bishops (from left): Chrysostomos of Smyrna (lynched), Prokopios of Iconium (imprisoned and poisoned), Gregory of Kydonies (executed), Euthymios of Zelon (died in prison and posthumously hanged), Ambrosios of Moschonisia (buried alive). The 1948 Convention on the Prevention and Punishment of the Crime of Genocide (CPPCG) was adopted by the United Nations General Assembly in December 1948 and came into force in January 1951. It defines genocide in legal terms. Before creation of the word "genocide", the destruction of the Ottoman Greeks was known by Greeks as "the Massacre" (in Greek: η Σφαγή), "the Great Catastrophe" (η Μεγάλη Καταστροφή), or "the Great Tragedy" (η Μεγάλη Τραγωδία). Matthaios Kofidis, former member of the Ottoman Parliament, was among the several notables of Pontus, hanged by an "Ad hoc Court of Turkish Independence" in Amasya, in 1921. In December 2007 the International Association of Genocide Scholars (IAGS) passed a resolution affirming that the 1914–23 campaign against Ottoman Greeks constituted genocide. Utilising the term "Greek Genocide", the resolution affirmed that alongside the Assyrians, Ottoman Greeks were subject to a genocide "qualitatively similar" to the Ottoman genocide of the Armenians. IAGS President Gregory Stanton urged the Turkish government to finally acknowledge the three genocides: "The history of these genocides is clear, and there is no more excuse for the current Turkish government, which did not itself commit the crimes, to deny the facts." Drafted by Canadian scholar Adam Jones, the resolution was adopted on 1 December 2007 with the support of 83% of all voting IAGS members. Several scholars researching the Armenian genocide, such as Peter Balakian, Taner Akçam, Richard Hovannisian and Robert Melson, however stated that the issue had to be further researched before a resolution was passed." Manus Midlarsky notes a disjunction between statements of genocidal intent against the Greeks by Ottoman officials and their actions, pointing to the containment of massacres in selected "sensitive" areas and the large numbers of Greek survivors at the end of the war. Because of cultural and political ties of the Ottoman Greeks with European powers, Midlarsky argues, genocide was "not a viable option for the Ottomans in their case." Taner Akçam refers to contemporary accounts noting the difference in government treatment of Ottoman Greeks and Armenians during WW I and concludes that "despite the increasingly severe wartime policies, in particular for the period between late 1916 and the first months of 1917, the government's treatment of the Greeks – although comparable in some ways to the measures against the Armenians – differed in scope, intent, and motivation." Other genocide scholars, such as Dominik J. Schaller and Jürgen Zimmerer, however stated that the "genocidal quality of the murderous campaigns against Greeks" is "obvious". Niall Ferguson has drawn a comparison between sporadic massacres of Pontic Greek communities after 1922 and the fate of the Armenians. Seminars and courses in several western universities examine the events. These include the University of Michigan Dearborn and the University of New South Wales which has a dedicated research unit. The events are also documented in academic journals such as Genocide Studies International. Following an initiative of MPs of the so-called "patriotic" wing of the ruling PASOK party's parliamentary group and like-minded MPs of conservative New Democracy, the Greek Parliament passed two laws on the fate of the Ottoman Greeks; the first in 1994 and the second in 1998. The decrees were published in the Greek Government Gazette on 8 March 1994 and 13 October 1998 respectively. The 1994 decree affirmed the genocide in the Pontus region of Asia Minor and designated 19 May (the day Mustafa Kemal landed in Samsun in 1919) a day of commemoration, (called Pontian Greek Genocide Remembrance Day) while the 1998 decree affirmed the genocide of Greeks in Asia Minor as a whole and designated 14 September a day of commemoration. These laws were signed by the President of Greece but were not immediately ratified after political interventions. After leftist newspaper I Avgi initiated a campaign against the application of this law, the subject became subject of a political debate. The president of the left-ecologist Synaspismos party Nikos Konstantopoulos and historian Angelos Elefantis, known for his books on the history of Greek communism, were two of the major figures of the political left who expressed their opposition to the decree. However, the non-parliamentary left-wing nationalist intellectual and author George Karabelias bitterly criticized Elefantis and others opposing the recognition of genocide and called them "revisionist historians", accusing the Greek mainstream left of a "distorted ideological evolution". He said that for the Greek left 19 May is a "day of amnesia". In the late 2000s the Communist Party of Greece adopted the term "Genocide of the Pontic (Greeks)" (Γενοκτονία Ποντίων) in its official newspaper Rizospastis and participates in memorial events. The Republic of Cyprus has also officially called the events "Greek Genocide in Pontus of Asia Minor". In response to the 1998 law, the Turkish government released a statement which claimed that describing the events as genocide was "without any historical basis". "We condemn and protest this resolution" a Turkish Foreign Ministry statement said. "With this resolution the Greek Parliament, which in fact has to apologize to the Turkish people for the large-scale destruction and massacres Greece perpetrated in Anatolia, not only sustains the traditional Greek policy of distorting history, but it also displays that the expansionist Greek mentality is still alive," the statement added. On 11 March 2010, Sweden's Riksdag passed a motion recognising "as an act of genocide the killing of Armenians, Assyrians/Syriacs/Chaldeans and Pontic Greeks in 1915". On 14 May 2013, the government of New South Wales was submitted a genocide recognition motion by Fred Nile of the Christian Democratic Party, which was later passed making it the fourth political entity to recognise the genocide. In March 2015, the National Assembly of Armenia unanimously adopted a resolution recognizing both the Greek and Assyrian genocides. In April 2015, the States General of the Netherlands and the Austrian Parliament passed resolutions recognizing the Greek and Assyrian genocides. In contrast to the Treaty of Sèvres, the superseding Treaty of Lausanne in 1923 dealt with these events by making no reference or mention, and thus sealed the end of the Asia Minor Catastrophe. A subsequent peace treaty (Greco-Turkish Treaty of Friendship in June 1930) between Greece and Turkey. Greece made several concessions to settle all open issues between the two countries in return for peace in the region. The Second World War, the Civil War, the Military junta and the political turmoil in Greece that followed, forced Greece to focus on its survival and other problems rather than seek recognition of these events. The political environment of the Cold War, in which Turkey and Greece were supposed to be allies – facing one common Communist enemy – not adversaries or competitors. In his book With Intent to Destroy: Reflections on Genocide, Colin Tatz argue that Turkey denies the genocide so as not to jeopardize "its ninety-five-year-old dream of becoming the beacon of democracy in the Near East". Turkish denialism of the genocide of 1.5 million Armenians is official, riven, driven, constant, rampant, and increasing each year since the events of 1915 to 1922. It is state-funded, with special departments and units in overseas missions whose sole purpose is to dilute, counter, minimise, trivialise and relativise every reference to the events which encompassed a genocide of Armenians, Pontian Greeks and Assyrian Christians in Asia Minor. A suppression of guilt and shame that a warrior nation, a "beacon of democracy" as it saw itself in 1908 (and since), slaughtered several ethnic populations. Democracies, it is said, don't commit genocide; ergo, Turkey couldn't and didn't do so. A cultural and social ethos of honour, a compelling and compulsive need to remove any blots on the national escutcheon. A chronic fear that admission will lead to massive claims for reparation and restitution. To overcome fears of social fragmentation in a society that is still very much a state in transition. A "logical" belief that because the genocide was committed with impunity, so denial will also meet with neither opposition nor obloquy. An inner knowledge that the juggernaut denial industry has a momentum of its own and can't be stopped even if they wanted it to stop. The Greek genocide is remembered in a number of modern works. Not Even My Name by Thea Halo is the story of the survival, at age ten, of her mother Sano (Themia) Halo (original name Euthemia "Themia" Barytimidou, Pontic Greek: Ευθυμία Βαρυτιμίδου), along the death march during the Greek genocide that annihilated her family. The title refers to Themia being renamed to Sano by an Arabic-speaking family who could not pronounce her Greek name, after they took her in as a servant during the Greek genocide. The story is told by her daughter Thea, and includes their poignant mother-daughter pilgrimage to Pontus Turkey in search of Sano's home seventy years after her exile. The Number 31328 is an autobiography by the Greek novelist Elias Venezis that tells of his experiences during the Greek genocide on a death march into the interior from his native home in Ayvali (Greek: Kydonies, Κυδωνίες), Turkey. Of the 3000 "conscripted" into his "labour brigade" (otherwise known as Amele Taburlari or Amele Taburu) only 23 survived. The title refers to the number (31328) assigned to Elias by the Turkish army during the death march. The book was made into a movie with the title 1922 by Nikos Koundouros in 1978, but was banned in Greece until 1982 due to pressure from Turkey, which stated that allowing the movie to be shown in Greece would damage Greek-Turkish relations. Memorials commemorating the plight of Ottoman Greeks have been erected throughout Greece, as well as in a number of other countries including Australia, Canada, Germany, Sweden, and the United States. ^ Jones, Adam (2010). Genocide: A Comprehensive Introduction. Routledge. p. 163. ISBN 978-1136937972. ^ I. Law (17 October 2014). Mediterranean Racisms: Connections and Complexities in the Racialization of the Mediterranean Region. Palgrave Macmillan UK. p. 54. ISBN 978-1-137-26347-6. ^ Jones 2006, pp. 154–55. ^ a b Howland, Charles P. "Greece and Her Refugees", Foreign Affairs, The Council on Foreign Relations. July 1926. ^ a b Matthew J. Gibney, Randall Hansen. (2005). Immigration and Asylum: from 1900 to the Present, Volume 3. ABC-CLIO. p. 377. ISBN 978-1-57607-796-2. The total number of Christians who fled to Greece was probably in the region of I.2 million with the main wave occurring in 1922 before the signing of the convention. According to the official records of the Mixed Commission set up to monitor the movements, the "Greeks' who were transferred after 1923 numbered 189,916 and the number of Muslims expelled to Turkey was 355,635 [Ladas I932, 438–439; but using the same source Eddy 1931, 201 states that the post-1923 exchange involved 192,356 Greeks from Turkey and 354,647 Muslims from Greece]. ^ a b c "Resolution" (PDF). IAGS. 16 December 2007. .
^ "Genocide Resolution approved by Swedish Parliament", News (full text), AM , containing both the IAGS and the Swedish resolutions. ^ Schaller, Dominik J; Zimmerer, Jürgen (2008). "Late Ottoman genocides: the dissolution of the Ottoman Empire and Young Turkish population and extermination policies – Introduction". Journal of Genocide Research. 10 (1): 7–14. doi:10.1080/14623520801950820. ^ "Sweden to recognize Armenian genocide". thelocal.se. 2010. Retrieved 21 April 2017. ^ "Sweden: Parliament Approves Resolution on Armenian Genocide". loc.gov. 2010. Retrieved 21 April 2017. ^ "Adoption of declaration to certify that Armenia recognizes Greek and Assyrian genocide: Eduard Sharmazanov". armenpress.am. 2015. Retrieved 21 April 2017. ^ "Dutch Parliament Recognizes Greek, Assyrian and Armenian Genocide". greekreporter.com. 2015. Retrieved 21 April 2017. ^ "Dutch Parliament Recognizes Assyrian, Greek and Armenian Genocide". aina.org. 2015. Retrieved 21 April 2017. ^ "German Bundestag recognizes the Armenian Genocide". armradio.am. 2016. Retrieved 21 April 2017. ^ "Bundestag calls Turkish crimes against Armenians genocide". b92.net. 2016. Retrieved 21 April 2017. ^ "Austrian Parliament Recognizes Armenian, Assyrian, Greek Genocide". aina.org. 2015. Retrieved 21 April 2017. ^ "Austrian Parliament Recognizes Armenian Genocide". MassisPost. 2015. Retrieved 21 April 2017. ^ "Czech Parliament Approves Armenian Genocide Resolution". The Armenian Weekly. 2017. Retrieved 27 April 2017. ^ "Czech Republic recognizes the Armenian Genocide". ArmenPress. 2017. Retrieved 27 April 2017. ^ "Czech Republic Parliament recognizes the Armenian Genocide". ArmRadio. 2017. Retrieved 27 April 2017. ^ Bloxham 2005, p. 150. ^ Ferguson 2006, p. 180. ^ Kelder, Jorrit (2004–2005). "The Chariots of Ahhiyawa". Dacia, Revue d'Archéologie et d'Histoire Ancienne (48–49): 151–160. The Madduwatta text represents the first textual evidence for Greek incursions on the Anatolian mainland... Mycenaeans settled there already during LH IIB (around 1450 BC; Niemeier, 1998, 142). ^ Eric Hobsbawm (1992). Nations and nationalism since 1780 programme, myth, reality. Cambridge, UK: Cambridge University Press. p. 133. ISBN 978-0-521-43961-9. ^ a b c d Travis 2009, p. 637. ^ David Noel Freedman; Allen C. Myers; Astrid Biles Beck (2000). Eerdmans Dictionary of the Bible. Wm. B. Eerdmans Publishing. p. 61. ISBN 978-0-8028-2400-4. Retrieved 24 March 2013. ^ Theo van den Hout (27 October 2011). The Elements of Hittite. Cambridge University Press. p. 1. ISBN 978-1-139-50178-1. Retrieved 24 March 2013. ^ Swain, Simon; Adams, J. Maxwell; Janse, Mark (2002). Bilingualism in Ancient Society: Language Contact and the Written Word. Oxford [Oxfordshire]: Oxford University Press. pp. 246–266. ISBN 978-0-19-924506-2. ^ Hanioğlu, M. Şükrü (2010). A Brief History of the Late Ottoman Empire. Princeton University Press. p. 36. ISBN 978-0-691-14617-1. The Ottoman state never sought to impose Turkish on subject peoples…Some ethno-religious groups, when outnumbered by Turks, did accept Turkish vernacular through a gradual process of acculturation. While the Greeks of the Peloponnese, Thessaly, Epirus, Macedonia, Thrace, and west Anatolian littoral continued to speak and write in Greek, The Greeks of Cappadocia (Karaman) spoke Turkish and wrote Turkish in Greek script. Similarly, a large majority of Armenians in the empire adopted Turkish as their vernacular and wrote Turkish in Armenian characters, all efforts to the contrary by the Mkhitarist order notwithstanding. The first novels published in the Ottoman Empire in the mid-nineteenth century were by Armenians and Cappadocian Greeks; they wrote them in Turkish, using the Armenian and Greek alphabets. Karpat, Kemal (1985). Ottoman Population, 1830–1914: Demographic and Social Characteristics. Madison: Madison University Press. ^ Alexandris 1999, pp. 71–2 states that the 1918 Ethnological Map Illustrating Hellenism in the Balkan Peninsula and Asia Minor, composed by Greek archaeologist Georgios Soteriades, was an instance of the usual practice of inflating the numbers of ethnic groups living in disputed territories in the Paris Peace conference. ^ Akçam 2012, pp. 68 f.
^ Akçam 2012, p. 71. ^ a b Akçam 2012, pp. 80–82. ^ Akçam 2012, pp. 84 f.
^ Akçam 2012, p. 84. ^ Turks Slay 100 Greeks. The New York Times, June 17, 1914. ^ . "The 1914 Cleansing of Aegean Greeks as a Case of Violent Turkification". In Schaller & Zimmerer (2009), pp. 34 ff. ^ . "The 1914 Cleansing of Aegean Greeks as a Case of Violent Turkification". In Schaller & Zimmerer (2009), pp. 41 ff. ^ Hull 2005, p. 273. ^ King 1922, p. 437. ^ Akçam 2012, p. 65. ^ a b Akçam 2012, pp. 65–7. ^ Akçam 2012, p. 69. ^ Akçam 2012, pp. 94–96. ^ Akçam 2012, p. 97. ^ Akçam 2012, pp. 99 f.
^ Akçam 2012, pp. 100 f.
^ Akçam 2012, pp. 102–4. ^ Avedian 2009, p. 40. ^ a b c d e f Rendel 1922. ^ Morgenthau 1919, p. 326. ^ Akçam 2012, pp. 105 f.
^ Akçam 2012, pp. 109 f.
^ Akçam 2012, pp. 111. ^ Akçam 2012, pp. 111 f.
^ Akçam 2012, pp. 112. ^ Akçam 2012, pp. 113. ^ Akçam 2012, pp. 113–116. ^ Akçam 2012, pp. 116–119. ^ Avedian 2009, p. 47. ^ Midlarsky, Manus I (2005). The Killing Trap: Genocide in the Twentieth Century. Cambridge University Press. pp. 342–43. ISBN 978-0-521-81545-1. Many (Greeks), however, were massacred by the Turks, especially at Smyrna (today's İzmir) as the Greek army withdrew at the end of their headlong retreat from central Anatolia at the end of the Greco-Turkish War. Especially poorly treated were the Pontic Greeks in eastern Anatolia on the Black Sea. In 1920, as the Greek army advanced, many were deported to the Mesopotamian desert as had been the Armenians before them. Nevertheless, approximately 1,200,000 Ottoman Greek refugees arrived in Greece at the end of the war. When one adds to the total the Greeks of Constantinople who, by agreement, were not forced to flee, then the total number comes closer to the 1,500,000 Greeks in Anatolia and Thrace. Here, a strong distinction between intention and action is found. According to the Austrian consul at Amisos, Kwiatkowski, in his November 30, 1916, report to foreign minister Baron Burian: 'on 26 November Rafet Bey told me: "we must finish off the Greeks as we did with the Armenians..." on 28 November Rafet Bey told me: "today I sent squads to the interior to kill every Greek on sight." I fear for the elimination of the entire Greek population and a repeat of what occurred last year.' Or according to a January 31, 1917, report by Chancellor Hollweg of Austria: the indications are that the Turks plan to eliminate the Greek element as enemies of the state, as they did earlier with the Armenians. The strategy implemented by the Turks is of displacing people to the interior without taking measures for their survival by exposing them to death, hunger, and illness. The abandoned homes are then looted and burnt or destroyed. Whatever was done to the Armenians is being repeated with the Greeks. Massacres most likely did take place at Amisos and other villages in Pontus. Yet given the large number of surviving Greeks, especially relative to the small number of Armenian survivors, the massacres apparently were restricted to Pontus, Smyrna, and selected other 'sensitive' regions. ^ Agtzidis 1992, pp. 164–165. ^ Georganopoulos 2010, pp. 227–232. ^ Georganopoulos 2010, pp. 245–247. ^ Mariana, Correia; Letizia, Dipasquale; Saverio, Mecca (2014). VERSUS: Heritage for Tomorrow. Firenze University Press. p. 69. ISBN 9788866557418. ^ Doumanis, Nicholas (2013). Before the Nation: Muslim-Christian Coexistence and Its Destruction in Late-Ottoman Anatolia. OUP Oxford. p. 99. ISBN 9780199547043. ^ a b Hofmann, Tessa. "Yalova/Nicomedia 1920/1921. Massacres and Inter- Ethnic Conflict in a Failing State". Institut für Diaspora- und Genozidforschung: 3–5. Retrieved 2 July 2016. ^ Akçam, Taner (1996). Armenien und der Völkermord: Die Istanbuler Prozesse und die Türkische Nationalbewegung. Hamburg: Hamburger Edition. p. 185. ^ a b Rudolph J. Rummel, Irving Louis Horowitz (1994). "Turkey's Genocidal Purges". Death by Government. Transaction Publishers. p. 233. ISBN 978-1-56000-927-6. ^ Naimark, Norman (2002). Fires of hatred: Ethnic cleansing in 20th century Europe. Harvard University Press. p. 52. ISBN 978-0-674-00994-3. Retrieved 3 June 2011. ^ Rummel 1998, p. Chapter 5. ^ Toynbee (1922), pp. 312–313. ^ Nikolaos Hlamides, "The Greek Relief Committee: America's Response to the Greek Genocide", Genocide Studies and Prevention 3, 3 (December 2008): 375–383. ^ a b just host. "Welcome aihgs.com - Justhost.com". Archived from the original on 13 March 2016. Retrieved 19 May 2016. ^ The New York Times Advanced search engine for article and headline archives (subscription necessary for viewing article content). ^ Morgenthau 1918, p. 201. ^ Kırlı, Biray Kolluoğlu (2005). "Forgetting the Smyrna Fire" (PDF). History Workshop Journal (60): 25–44. Retrieved 10 March 2016. ^ Roessel, David (2001). In Byron's Shadow : Modern Greece in the English and American Imagination: Modern Greece in the English and American Imagination. Oxford University Press. pp. 327–8. ISBN 9780198032908. ^ Buzanski, Peter Michael (1960). Admiral Mark L. Bristol and Turkish-American Relations, 1919–1922. University of California, Berkeley. p. 176. ^ Marketos, James L (2006). "George Horton: An American Witness in Smyrna" (PDF). AHI World. Retrieved 3 November 2009. ^ Naimark, Norman M. Fires of hatred: ethnic cleansing in twentieth-century Europe (2002), Harvard University Press, pp. 47–52. ^ Jones 2010, pp. 150–51: "By the beginning of the First World War, a majority of the region’s ethnic Greeks still lived in present-day Turkey, mostly in Thrace (the only remaining Ottoman territory in Europe, abutting the Greek border), and along the Aegean and Black Sea coasts. They would be targeted both prior to and alongside the Armenians of Anatolia and Assyrians of Anatolia and Mesopotamia ... The major populations of 'Anatolian Greeks' include those along the Aegean coast and in Cappadocia (central Anatolia), but not the Greeks of the Thrace region west of the Bosphorus ... A 'Christian genocide' framing acknowledges the historic claims of Assyrian and Greek peoples, and the movements now stirring for recognition and restitution among Greek and Assyrian diasporas. It also brings to light the quite staggering cumulative death toll among the various Christian groups targeted ... of the 1.5 million Greeks of Asia minor – Ionians, Pontians, and Cappadocians – approximately 750,000 were massacred and 750,000 exiled. Pontian deaths alone totaled 353,000." ^ Rummel, R.J. "Statistics Of Turkey's Democide Estimates, Calculations, And Sources". University of Hawai'i. Retrieved 15 April 2015. Table 5.1B. ^ Hinton, Alexander Laban; Pointe, Thomas La; Irvin-Erickson, Douglas (2013). Hidden Genocides: Power, Knowledge, Memory. Rutgers University Press. p. 180. ISBN 9780813561646. The foremost expert on genocide statistics, Rudolph Rummel, has estimated that from 1914 to 1918 the Ottomans exterminated up to 384,000, Greeks, while from 1920 to 1922 another 264,000 Greeks were killed by the Nationalists. ^ Jones 2010, p. 150. ^ a b Jones 2010, p. 166: "An estimate of the Pontian Greek death toll at all stages of the anti-Christian genocide is about 350,000; for all the Greeks of the Ottoman realm taken together, the toll surely exceeded half a million, and may approach the 900,000 killed that a team of US researchers found in the early postwar period. Most surviving Greeks were expelled to Greece as part of the tumultuous 'population exchanges' that set the seal on a heavily 'Turkified' state." ^ Taner Akcam (21 August 2007). A Shameful Act: The Armenian Genocide and the Question of Turkish Responsibility. Henry Holt and Company. p. 107. ISBN 978-1-4668-3212-1. ^ Fotiadis, Konstantinos (2015). The Genocide of the Pontian Greeks. Thessaloniki: K. & M. Antonis Stamoulis Publications. pp. 61–62. ^ "Treaty of Sevres, 1920". Retrieved 19 May 2016. ^ Geniki Statistiki Ypiresia tis Ellados (Statistical Annual of Greece), Statistia apotelesmata tis apografis sou plithysmou tis Ellados tis 15–16 Maiou 1928, pg.41. Athens: National Printing Office, 1930. Quoted in Kontogiorgi, Elisabeth (17 August 2006). Population Exchange in Greek Macedonia: The Forced Settlement of Refugees 1922–1930. Oxford University Press. pp. 96, footnote 56. ISBN 978-0-19-927896-1. ^ Sofos, Spyros A.; Özkirimli, Umut (2008). Tormented by History: Nationalism in Greece and Turkey. C Hurst & Co Publishers Ltd. pp. 116–117. ISBN 978-1-85065-899-3. ^ Vryonis, Speros (2000). The great catastrophes: Asia Minor/Smyrna--September 1922; Constantinople—September 6&7, 1955 : a lecture. Order of Saint Andrew the Apostle. p. 5. It is remarkable to what degree the Orthodox hierarchs and clergy shared the fate of the people and were martyred. According to statistics of the church, of the 459 bishops, metropolitans and clergy of the metropolitanate of Smyrna, some 347 were murdered in an atrocious manner. ^ Mcdonnell, MA; Moses, AD (December 2005). "Raphael Lemkin as historian of genocide in the Americas". Journal of Genocide Research. 7 (4): 501–529. CiteSeerX 10.1.1.496.7975. doi:10.1080/14623520500349951. .
^ Constantine G. Hatzidimitriou (2005). American Accounts Documenting the Destruction of Smyrna by the Kemalist Turkish Forces: September 1922. New Rochelle, NY: Caratzas. p. 1. .
^ Bruce Clark (2006). Twice a Stranger: The Mass Expulsion that Forged Modern Greece and Turkey. Cambridge, MA: Harvard University Press. pp. 112–114. ISBN 9780674023680. ^ "International Genocide Scholars Association officially recognises Assyrian, Greek Genocides" (PDF) (Press release). IAGS. 16 December 2007. Archived from the original (PDF) on 18 January 2012. ^ "International Genocide Scholars Association officially recognizes Assyrian, Greek Genocides". Assyrian International News Agency. 15 December 2007. Retrieved 24 February 2016. ^ Akçam 2012, p. 123. ^ Schaller, Dominik J.; Zimmerer, Jurgen (2008). "Late Ottoman genocides: the dissolution of the Ottoman Empire and Young Turkish population and extermination policies". Journal of Genocide Research. 10 (1): 7–14. doi:10.1080/14623520801950820. ^ Ferguson 2006, p. 182. ^ "Before the Silence". Retrieved 19 May 2016. ^ just host. "Welcome aihgs.com - Justhost.com". Archived from the original on 4 March 2016. Retrieved 19 May 2016. ^ Κωστόπουλος 2007, pp. 266–7. ^ "Η 19η Μαΐου, καθιερώνεται ως ημέρα μνήμης της γενοκτονίας των Ελλήνων του Πόντου". Act No. 2193/94 of 11 March 1994. Government Gazette of the Hellenic Republic (in Greek). Archived from the original on 25 February 2016. .
^ Tsolakidou, Stella (18 May 2013). "May 19, Pontian Greek Genocide Remembrance Day". Greek Reporter. Retrieved 17 May 2018. ^ "Καθιέρωση της 14 Σεπτεμβρίου ως ημέρας εθνικής μνήμης της Γενοκτονίας των Ελλήνων της Μικράς Ασίας απο το Τουρκικό Κράτος". Act No. 2645/98 of 13 October 1998 (in Greek). Government Gazette of the Hellenic Republic. Archived from the original on 24 February 2016. .
^ Robert Fisk (13 February 2001). "Athens and Ankara at odds over genocide". The Independent. London. Archived from the original on 1 July 2008. ^ Tsibiridou, Fotini (2009). "Writing about Turks and Powerful Others: Journalistic Heteroglossia in Western Thrace". In Theodossopoulos, Dimitrios. When Greeks Think About Turks: The View from Anthropology. Routledge. p. 134. ^ Pontic Genocide, Responsible is the imperialistic opportunism, 20 May 2009. ^ Day in Memory of the Pontic Greeks Genocide. The poor in the center of powerful confrontations. 20 May 2010. ^ rizospastis.gr – Synchroni Epochi (2008-05-20). ""Οι λαοί πρέπει να θυμούνται" – ΠΟΛΙΤΙΚΗ – ΡΙΖΟΣΠΑΣΤΗΣ". ΡΙΖΟΣΠΑΣΤΗΣ. Retrieved 19 May 2016. ^ "Government Spokesman's written statement on the Greek Pontiac Genocide, yesterday". Republic of Cyprus Press and Information Office. Retrieved 16 May 2016. ^ Turkey Denounces Greek 'Genocide' Resolution, Office of the Prime Minister, Directorate General of Press and Information, 30 September 1998, retrieved 5 February 2007 . ^ "Motion 2008/09:U332 Genocide of Armenians, Assyrians/Syriacs/Chaldeans and Pontiac Greeks in 1915". Stockholm: Riksdag. 11 March 2010. Archived from the original on 9 July 2011. Retrieved 12 March 2010. ^ "Fred Nile: Genocide motion not against modern State of Turkey". PanARMENIAN.Net. Retrieved 19 May 2016. ^ "Dutch Parliament Recognizes Greek, Assyrian and Armenian Genocide". Greek Reporter. 11 April 2015. ^ Fotiadis, 2004 & As summarized by Theophanis Malkidis in his presentation of the 14th volume of Fodiadis' work on the Greek Genocide. ^ Malkidis Theophanis, Review of the book "Η Γενοκτονία των Ελλήνων του Πόντου" (The Genocide of the Pontic Greeks), vol. 14, Thessaloniki, Herodotos Publishers, 2002–2005. In Greek language. ^ Colin Martin Tatz (2003). With Intent to Destroy: Reflections on Genocide. Verso. p. 13. ISBN 978-1-85984-550-9. Retrieved 8 June 2013. Turkey, still struggling to achieve its ninety-five-year-old dream of becoming the beacon of democracy in the Near East, does everything possible to deny its genocide of the Armenians, Assyrians and Pontian Greeks. ^ a b Coleman, Elizabeth Burns; White, Kevin (2006), Negotiating the Sacred: Blasphemy and Sacrilege in a Multicultural Society (PDF), pp. 82–83, ISBN 978-1920942472 . ^ "Συνέντευξη: Η Σάνο Χάλο, η "Γιαγιά των Ποντίων", μέσα από τα μάτια της Θία Χάλο". ^ "Obituary: Sano Themia Halo (1909-2014)". 2014-05-04. ^ "The Number 31328: The Book of Slavery". Halo, Thea (2001). Not Even My Name, New York: Picador. King, William C (1922), Complete History of the World War: Visualizing the Great Conflict in all Theaters of Action 1914–1918, MA, US: The History Associates, archived from the original on 1 August 2012 . Morgenthau, Henry sr (1918), Ambassador Morgenthau's Story (PDF), = Garden City, NY: Doubleday, Page & Co .
——— (1919) , Ambassador Morgenthau's Story, Garden City, NY: Doubleday, Page & Co .
Rendel, GW (20 March 1922), Memorandum by Mr. Rendel on Turkish Massacres and Persecutions of Minorities since the Armistice (memorandum), British Foreign Office . Toynbee, Arnold J (1922), The Western question in Greece and Turkey: a study in the contact of civilisations, Boston: Houghton Mifflin . Valavanis, G. K. (1925), Σύγχρονος Γενική Ιστορία του Πόντου [Contemporary General History of Pontus] (in Greek), Athens, archived from the original on 8 November 2015 . Agtzidis, Vlasis (1992). "Το κίνημα ανεξαρτησίας του Πόντου και οι αυτόνομες Ελληνικές περιοχές στη Σοβιετική Ένωση του μεσοπολέμου" [The movement for the independence of Pontus and the autonomous Greek regions in the Soviet Union during the interwar period]. Bulletin of the Asia Minor Studies Center (in Greek). 9 (1): 157–196. doi:10.12681/deltiokms.135. Akçam, Taner (2006). A Shameful Act. Akçam, Taner (2012). The Young Turks' Crime Against Humanity: The Armenian Genocide and Ethnic Cleansing in the Ottoman Empire. Princeton/Oxford: Princeton University Press. Georganopoulos, Evripidis (2010). "Η προσπάθεια σύστασης ελληνικής μεραρχίας Καυκάσου το 1917 και οι λόγοι της αποτυχίας της" [The attempt to raise the Greek Caucasus Division and the reasons for its failure] (PDF). 1st Panhellenic History Congress (in Greek). 1 (1): 227–251. Retrieved 8 May 2018. Alexandris, Alexis (1999). "The Greek census of Anatolia and Thrace (1910–1912): a contribution to Ottoman Historical Demography". In Gondicas, Dimitri; Issawi, Charles. Ottoman Greeks in the age of nationalism: Politics, Economy and Society in the Nineteenth Century. Princeton, N.J.: Darwin. pp. 45–76. Ascherson, Neal (1995). Black Sea, New York: Hill and Wang, ISBN 0-8090-3043-8. Avedian, Vahagn (2009), The Armenian Genocide 1915: From a Neutral Small State's Perspective: Sweden (PDF) (unpublished master thesis paper), Uppsala University . Bierstadt, Edward Hale (1924), The Great Betrayal; A Survey of the Near East Problem, New York: RM McBride & Co .
Ferguson, Niall (2006), The War of the World: Twentieth-century Conflict And the Descent of the West, New York: Penguin, ISBN 978-1-59420-100-4 . Fotiadis, Constantinos Emm (2004), The Genocide of the Pontus Greeks by the Turks, 13, 14, Thessaloniki: Herodotus . Hull, Isabel V (2005), Absolute Destruction: Military Culture and the Practices of War in Imperial Germany, Ithaca: Cornell University Press . Jones, Adam (2006), Genocide: A Comprehensive Introduction, Routledge . ——— (2010) , Genocide: A Comprehensive Introduction, Taylor & Francis, ISBN 978-0-415-48618-7 . Klapsis, Antonis (2014). "Violent Uprooting and Forced Migration: A Demographic Analysis of the Greek Populations of Asia Minor, Pontus and Eastern Thrace". Middle Eastern Studies. 50 (4): 622–639. doi:10.1080/00263206.2014.901218. Κωστόπουλος, Τάσος (2007). Πόλεμος και Εθνοκάθαρση: Η ξεχασμένη πλευρά μιας δεκαετούς εθνικής εξόρμησης (1912-1922). Athens: Βιβλιόραμα. Levene, Mark (Winter 1998), "Creating a Modern "Zone of Genocide": The Impact of Nation- and State-Formation on Eastern Anatolia, 1878–1923", Holocaust and Genocide Studies, 12 (3): 393–433, doi:10.1093/hgs/12.3.393 . Midlarsky, Manus I. (2005). The Killing Trap, Cambridge: Cambridge University Press. Naimark, Norman M. (2001). Fires of Hatred: Ethnic Cleansing in Twentieth-Century Europe, Cambridge and London: Harvard University Press. Peterson, Merrill D (2004), Starving Armenians: America and the Armenian Genocide, 1915–1930 and After, Charlottesville: University of Virginia Press . Rummel, RJ. "Statistics of Democide". Chapter 5, Statistics of Turkey's Democide Estimates, Calculations, and Sources. Retrieved 4 October 2006. Travis, Hannibal (2009), "The Cultural and Intellectual Property Interests of the Indigenous Peoples of Turkey and Iraq", Texas Weleyan Law Review, 15: 601–80, SSRN 1549804, The U.N. Declaration on the Rights of Indigenous Peoples requires states to provide an effective remedy to indigenous peoples deprived of their cultural, religious, or intellectual property (IP) without their free, prior and informed consent. The Declaration could prove to be an important safeguard for the indigenous peoples of Iraq and Turkey, the victims for centuries of massacres, assaults on their religious and cultural sites, theft and deterioration of their lands and cultural objects, and forced assimilation. These peoples, among them the Armenians, Assyrians, Greeks, and Yezidis of Turkey and Turkish-occupied Cyprus, and the Armenians, Assyrians, Yezidis, and Mandaeans of Iraq, have lost more than two-thirds of their peak populations, most of their cultural and religious sites, and thousands of priceless artifacts and specimens of visual art. Andreadis, George, Tamama: The Missing Girl of Pontos, Athens: Gordios, 1993. Barton, James L (1943), The Near East Relief, 1915–1930, New York: Russell Sage Foundation . ———; Sarafian, Ara (December 1998), "Turkish Atrocities": Statements of American Missionaries on the Destruction of Christian Communities in Ottoman Turkey, 1915–1917 . Compton, Carl C. The Morning Cometh, New Rochelle, NY: Aristide D. Caratzas, 1986. The Inter-Allied Commission of Inquiry into the Greek Occupation of Smyrna and Adjoining Territories, Documents of the Inter-Allied Commission of Inquiry into the Greek Occupation of Smyrna and Adjoining Territories (PDF) . Fotiadis, Konstantinos (2002–2004), Η γενοκτονία των Ελλήνων του Πόντου [The Genocide of the Greeks of Pontus] (in Greek), Thessaloniki: Herodotos . In fourteen volumes, including eleven volumes of materials (vols. 4–14). Karayinnides, Ioannis (1978), Ο γολγοθάς του Πόντου [The Golgotha of Pontus] (in Greek), Salonica . Koromila, Marianna (2002). The Greeks and the Black Sea, Panorama Cultural Society. Morgenthau, Henry sr (1974) , The Murder of a Nation, New York: Armenian General Benevolent Union of America . ——— (1929), I Was Sent to Athens, Garden City, NY: Doubleday, Doran & Co .
——— (1930), An International Drama, London: Jarrolds . Hofmann, Tessa, ed. (2004), Verfolgung, Vertreibung und Vernichtung der Christen im Osmanischen Reich 1912–1922 (in German), Münster: LIT, pp. 177–221, ISBN 978-3-8258-7823-8 . Lieberman, Benjamin (2006). Terrible Fate: Ethnic Cleansing in the Making of Modern Europe, Ivan R. Dee. de Murat, Jean. The Great Extirpation of Hellenism and Christianity in Asia Minor: the historic and systematic deception of world opinion concerning the hideous Christianity’s uprooting of 1922, Miami, FL (Athens, GR: A. Triantafillis) 1999. Pavlides, Ioannis. Pages of History of Pontus and Asia Minor, Salonica, GR, 1980. Shaw, Stanford J; Shaw, Ezel Kural, History of the Ottoman Empire and Modern Turkey, Cambridge University . Dominik J. Schaller; Jürgen Zimmerer, eds. (2013) . Late Ottoman Genocides: The Dissolution of the Ottoman Empire and Young Turkish Population and Extermination Policies. Routledge. ISBN 978-0-415-48012-3. Erik Sjöberg. THE MAKING OF THE GREEK GENOCIDE Contested Memories of the Ottoman Greek Catastrophe, ISBN 978-1-78533-325-5, 2016. Totten, Samuel; Jacobs, Steven L (2002). Pioneers of Genocide Studies (Clt). New Brunswick, NJ: Transaction Publishers. ISBN 978-0-7658-0151-7. Tsirkinidis, Harry. At last we uprooted them... The Genocide of Greeks of Pontos, Thrace, and Asia Minor, through the French archives, Thessaloniki: Kyriakidis Bros, 1999. Ward, Mark H. The Deportations in Asia Minor 1921–1922, London: Anglo-Hellenic League, 1922. Bjornlund, Matthias, "The 1914 cleansing of Aegean Greeks as a case of violent Turkification", Journal of Genocide Research, Volume 10, Issue 1, March 2008, pp. 41–58. Hlamides, Nikolaos, "The Greek Relief Committee: America’s Response to the Greek Genocide", Genocide Studies and Prevention, Volume 3, Issue 3, December 2008, pp. 375–83. Mourelos, Yannis (1985). "The 1914 Persecutions and the first Attempt at an Exchange of Minorities between Greece and Turkey". Balkan Studies. 26 (2): 389–413. Vryonis, Speros, "Greek Labor Battalions in Asia Minor", The Armenian Genocide: Cultural and Ethical Legacies (ed. Hovannisian, Richard), New Brunswick, NJ: Transaction Publishers, 2007, pp. 275–90. Taner, Akcam (2009), "The Greek 'Deportations' and Massacres of 1913–1914, A Trial Run for the Armenian Genocide", The Academic Conference on the Asia Minor Catastrophe (paper), IL, USA . Sait, Çetinoğlu (17–19 September 2010), "The Pontus Independence Movement and the Greek Genocide", Three Genocides, One Strategy (international conference), Athens . Wikimedia Commons has media related to Greek Genocide. "Massacre of Greeks Charged to the Turks",The Atlanta Constitution. 17 June 1914. "REPORTS MASSACRES OF GREEKS IN PONTUS; Central Council Says They Attend Execution of Prominent Natives for Alleged Rebellion." The NY Times. Sunday 6 November 1921.